Our mobile web design services are customized, affordable and designed using advanced mobile website designing tools. Solutions fit for every business. With escalating internet browsing activity on Mobile phones, businesses globally need to ensure that their websites are compatible with smart phone browsers. BrainPulse mobile development company offers mobile website designing services to ensure great experience for users who browse websites on mobile, smart-phones and PDA's. Our Mobile Website Designing experts identify various mobile browsers and accordingly develop content that fits in those browsers. No visual noise by trimming the site to the exposed minimum design factors, enabling effective web pages appearance on your devices. 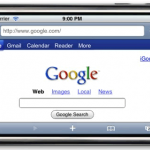 Browser compatibility to ensure that your website works fine on all handsets. Website architecture is designed to give the user a good browsing experience by taking care of color schemes used, minimum scrolls, less typing etc. In view of the Internet speed on mobile phone the website is optimized for quick downloading by using optimized graphics etc. Still have queries? Call us now on 0120-6790400 to get in touch with our Mobile Web Designing India team. They will tell you about our exclusive Mobile Website Designing plans made specially for the businesses like you.